Regular readers may have noted the Reluctant Gardener’s recent absence from the blogosphere. I got hip bursitis this summer, caused by incorrect weeding posture (I always said those nettles would be my undoing) and for months, the allotment was left to stew in its own juices. Short of human visitors, though, it hasn’t been short of animal ones. Health-wise, things aren’t quite back to normal for me. Little ‘itises’ follow the big one, like fish in a whale’s wake. But one of these is ‘allotment-lack-itis.’ Despite the frustrations of gardening in a jungle of nettles, rabbit burrows, flooding and heavy clay soil, my mood drops when I can’t do it. ‘Why don’t you go down there and just potter?’ says Mr MS.
Is this his way of telling me to eff off? Deciding not to make a mountain out of a molehill, I obey. Then I obey again, until wandering around doing nowt becomes a new way of life. While I’m idle, other creatures are doing good work. Chief among these is Mr Mole. His appearance isn’t really a surprise. A neighbour reported extensive earthworks on his own plot last year. I say ‘appearance’, but I’ve never seen this underground interloper in the flesh. I just find fresh mounds of finely churned soil every time I visit, as if a tiny phantom rotovator is on the loose. What to do? My neighbour says that although Mr Mole scoots under the roots, he won’t actually munch our lunch (those weren’t his exact words). So it’s best to do nothing. I’m inclined to agree, as doing nothing is my new speciality. Mr Mole, an insectivore, came in his own time and will go in his own time. That’s what happened on our neighbour’s plot, anyway. Hmm. I put two and two together but our neighbour is very nice, so I decide not to make four. It’s a boring number. A few plots down, more new creatures arrive. Three pigs. A notice says they’ve been brought in to clear the undergrowth. They do so in record time. They are like eating machines, consuming everything in sight including it seems their own shed door. What they don’t eat are some Tesco’s mushrooms that Mr MS brings down, leftovers from his fry-up. Nevertheless he scratches their bristly heads through the gate. He doesn’t mind their stinking to high heaven, being plastered in mud and pestered by ceaseless fleas. It doesn’t put off other pig visitors, either. Children flock down the river path. 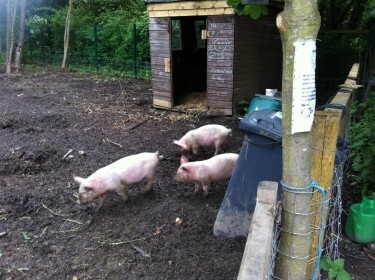 But a day comes when I visit the pigs’ plot to feed them pea pods and find no sign of their itchy pink bodies. I peer around the place, refusing to believe the obvious. Then tears come to my eyes. I am not good with Death, despite years of meditation. That’s why I’m prepared to be soft on Mr Mole. And I’m not looking forward to the children’s disappointment and the pathetic age-appropriate explanations given by accompanying adults. When I burst through the front door, wailing, Mr MS is at the cooker making a bacon sandwich. But here comes the happy ending (or happy not-ending) to today’s story. Dad, 90 this year, has had a pacemaker fitted. It has given him a new lease of life and he now has more energy than Mr MS and I combined. Whether he will use any to help me out on what is still technically his allotment remains to be seen. Drawing courtesy of Charlie Lyons. If you'd like to keep up-to-date with my news, you can do this by email or RSS feed. I'll keep your contact details private and you can unsubscribe at any time. Hey Mandy – v sorry to hear about yr bursitis. do hope it’s feeling loads better now. and that’s grrrreat news about yr Dad’s pacemaker. how fabby having a Bionic Dad! When I had an acre of garden in the Scottish Borders, we had a massive attack of moles one year, and they did eat a lot of the roots off our veg, and uprooted masses of stuff too, but we never found owt that worked to discourage them – including my Dad pouring neat paraffin down their tunnels, and then putting a transistor radio (in a placky bag) down a tunnel at full Radio 4 volume. I think the moles simply enjoyed Woman’s Hour, and hated You & Yours – like all good souls! Great that you are back on the blog – I had assumed it was the washout that was winter spring summer and winter of 2012 keeping you away. Hope the hip improves. Moles are not a great addition to a garden, or an allottment, although the soil they upend is very good for potting on. Henry David Thoreau (as you will know) spent two years at Walden Pond as an personal exercise in Mindfulness, doing absolutely nothing (or apparently nothing). He wrote,’It was morning, and lo, now it is evening, and nothing memorable is accomplished’. Who knows what your time spent with Mr Mole and friends is accomplishing?! Very glad to hear the good news about your Dad, very sorry to hear about the bursitis and other itis-es, and wish you a good, lasting recovery and some rewarding, healing time of non-doing! Really good to hear from you Mandy. So good to hear you are back pottering – it’s good for the soul. We spent some time rescuing bits of our garden yesterday. I took photographs of the dozen or so wonderfully “painted” snails I found and Clive rescued a frog from the storm drains. Our neighbours think we are mad! Absolutely smashing to get all your comments and ‘likes’ – thanks so much, folks. It is always more than great to hear from you. I love the idea of moles listening to Radio 4, Char. Talking of radio Janie, thanks for the allotment comedy link you sent through, what a find. Reb, I take your advice about potting soil and Deborah, the Thoreau comment makes me laugh every time I think about it. Lovely to hear from you Marilyn too, and Maria,’painted’ snails?? Explain please! I’ve heard of the CIA torturing prisoners with loud rock music but never thought Jenny Murray would be deployed in a similar way. Happy pottering! Never thought I’d see the words ‘Jenny Murray’ and ‘deployed’ in the same sentence. Congrats. Ahoy, the gardener, from Oregon. Spring, I swear to you it is spring under 3 inches of snow and a half inch of ice. Hello Kathy! Us too with the snow, though I’m sure a Wallowa winter is less whimsical than our Yorkshire one is turning out to be. I seems that you have come face to face with reality as my daughter did when she staying at a convent in Germany with her football team on tour. She noticed that there were only two goats when the day before there were three. And had she enjoyed a tasty stew the night before, Lamar?